Cooking with a wok is one of the simplest ways of making delicious food. Its versatility is unparalleled - it can be used it for stir-frying, braising, steaming and deep-frying. Factor in the speed with which most wok dishes can be cooked and you have the perfect kitchen tool.This fantastic new volume brings together the best of wok cooking; this book has 160 sizzling recipes to suit every palate and occasion. Sunil Vijayakar was born in Bombay where, while creating, making and styling food in the world of advertising and film, he set up a successful catering company. In 1993 he moved to London and has been busy working as a food stylist for advertising and publishing companies. Sunil writes for several magazines, including Food and Travel, Real, Tesco Magazine, and Best, and is the author of a number of cookbooks. Sunil's passions are travelling, eating and cooking. Becky Johnson worked as a chef in London and Ireland before travelling in South-east Asia. Becky now works as a food writer contributing to books and magazines. 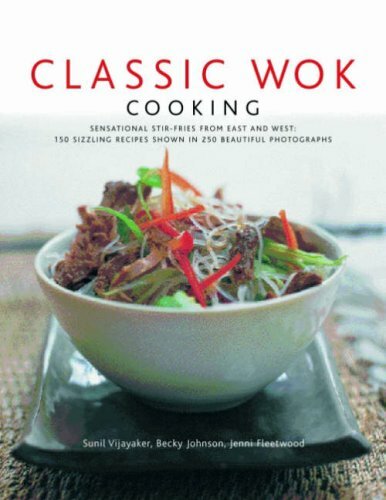 Jenni Fleetwood has compiled and written many cookering books on international cuisines, including the food of Africa, Asia, the Middle East and the Caribbean.